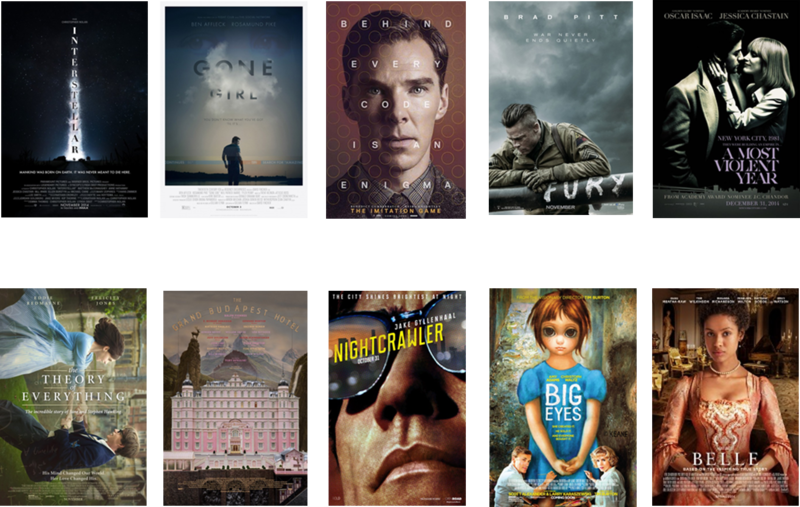 The rundown: Like last year, 114 films are officially eligible for this category this year. The two most notably ineligible films are “Whiplash” and Golden Globe nominee “Birdman.” I’m sad to see a few scores I really loved left off the shortlist, but we’ll get to those with the AFT Awards. At the head of the pack are Interstellar from regular nominee Hans Zimmer and Gone Girl from Trent Reznor and Atticus Ross, who won this award in 2010 for “The Social Network.” Another frequent nominee, Alexandre Desplat has a whopping five scores eligible, and The Imitation Game and The Grand Budapest Hotel represent his best chances. I’m betting on Steven Price, who won last year for “Gravity,” to return for Fury, and, somewhat ill-advisedly, I’m also championing someone who wasn’t nominated for “All is Lost” last year, Alex Ebert, who I think will be recognized for A Most Violent Year. Here’s hoping that film will be recognized at least somewhere. One possible crazy scenario: Darren Aronofsky regular Clint Mansell finally gets an Oscar nomination…for Noah.